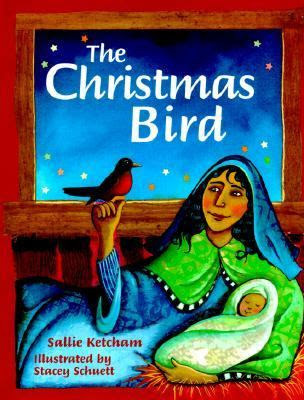 For story time this afternoon, I'm hoping to read Sallie Ketcham's The Christmas Bird, to the children. In it Ketcham retells an old English legend, about how the robin got its red breast. You can find the legend in verse form, here. Living in the north, we generally think of the robin as the bird of spring. But, if you Google Victorian Christmas cards, you'll find the image of the robin has been linked with Christmas, in other parts of the world, for a very long time. Since, I was already making ginger snaps for the children to deliver to our neighbors later today, I decided use some of the left over dough (from Betty Crocker's Gingerbread Men recipe), to make a story time treat. I rolled the dough out on wax paper. Gingerbread dough is not very sticky, so you can roll it on wax paper without flour. Then, I used a drinking glass to cut circles. With a butter knife, I sliced the circles in half, using half for a birds body, and dividing the other half in thirds, for tail feathers. I just pressed one of the triangles under the half circle. Then, the girls helped me sprinkle the fronts with red sugar sprinkles. I added mini-chocolate chip eyes, and almond sliver beaks, and baked them for 10 minutes, on a greased cookie sheet, in a 350 degree Fahrenheit oven. It looks like a beautiful book, and the treat is worth it! Russia doesn't have the same robin bird, but there is a bird very similar to this. The Russian word for it is "snegir" which means "a snow bird". Those are adorable and they go so well with the book. I can imagine that they would also be nice in the spring and another excuse to make gingerbread other than at Christmas time.. I haven't heard of this legend. I'll have to check it out. I love your robins! What a beautiful treat to go with your book.